Its full name is Ganden Namgyeling Monastery which is translated as, “Continent of Completely Victorious Happiness.” It was traditionally considered the seat of Gelug pa administrative and political power. It used to house about more than 2,000 monks, and now there are about 200-300 monks;. 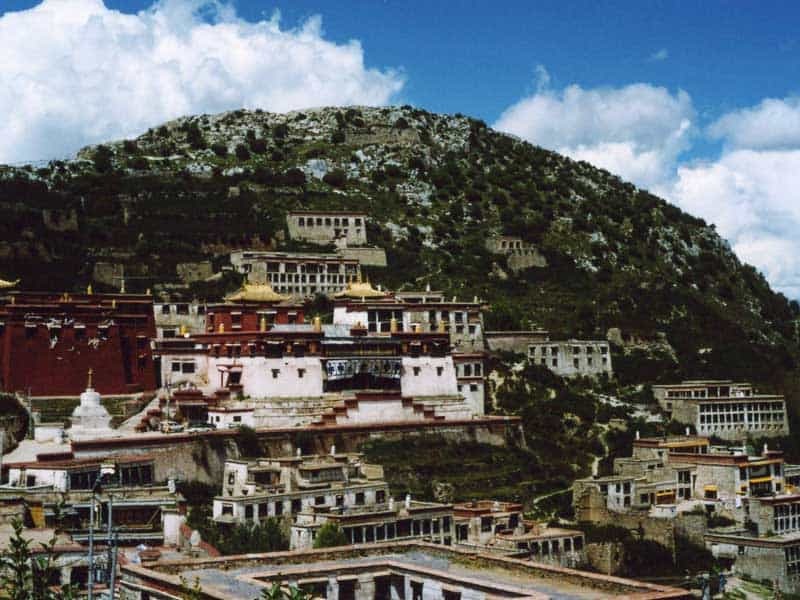 Ganden Monastery was founded in 1409 by Tsongkhapa – the founder of the Gelug pa. After Tsongkhapa died there in 1419. His preserved body was entombed at Ganden by his disciples in a silver and gold encrusted tomb. Ganden monastery is about 57 km East of Lhasa along the road that follows the south bank of the Kyi Chu river. The road turn-off is at road marker “4591 km” where a small village is at the road junction. From here a curved road leads onto the mountain for approximately 15-17 km. The monastery is near the top of Wangbu Ri on the mountain ridge of Gokpo Ri . The altitude of Ganden monastery is 4,750 meters. It is one of the ‘Great Three’ Gelug pa monasteries in the central Tibet. It denotes the Paradise of Tushita and the abode of Jampa, which is the future buddha.